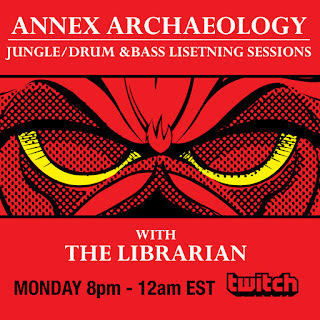 Airing Monday's at 9pm EST is Annex Archaeology on Twitch. 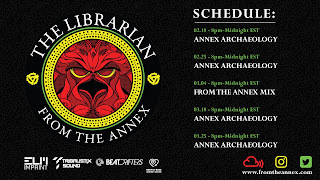 Join The Librarian as he long plays through the Annex. 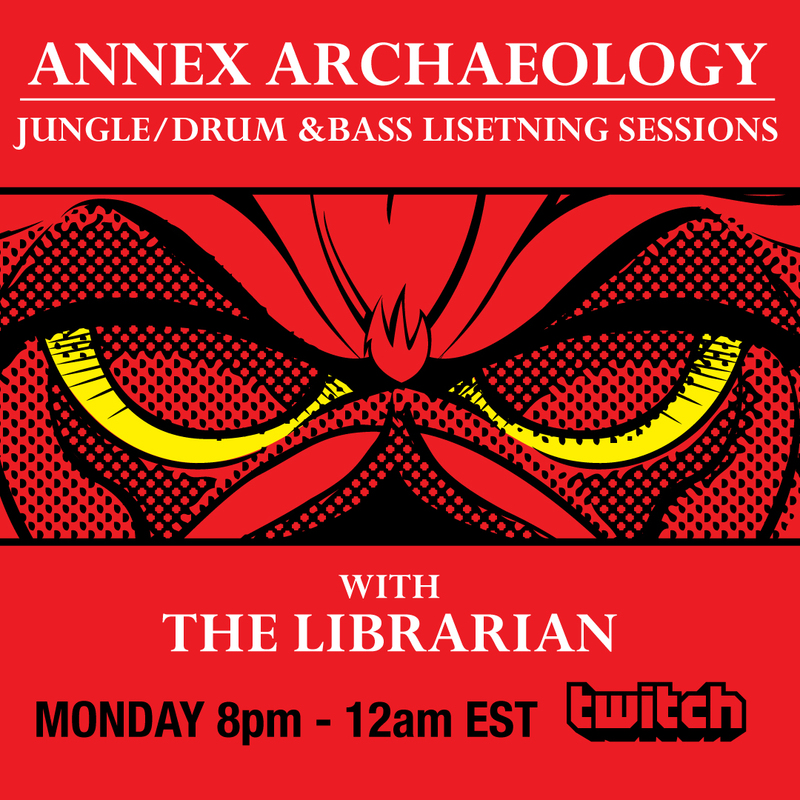 Archiving the vinyl collection and sharing his history with these tracks and whatever other tid bits of history he may or may not know about this music. 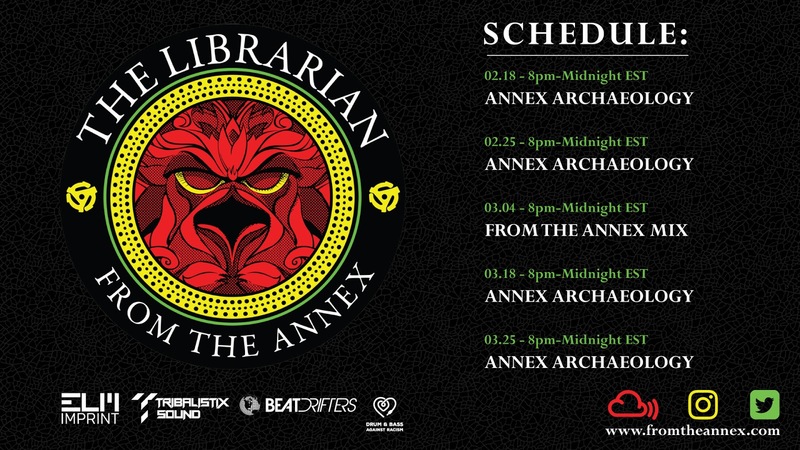 Then on the first Monday of every month we are bringing the fire with FROM THE ANNEX! This is a monthly throw down of whatever we are feeling from our inbox submittions, from last months releases or from our stash of newly archived collection! So come and join us over on the Twitch network. www.twitch.tv/fromtheannex. Let's get back into the saddle. Well after 9 months for forced DJing/Production vacation due to studio rebuilding... WE ARE BACK BABY! I feel like I almost should revive the Rusty Junglist show but I found my strade around an hour into the show. HA. Give me a break here I'm juggling video, audio, and social media all at the same time. It gives me amazing respect to Lion Dub, London Eleckricity, A1-VooDoo, & Sensenet who make it all look effortless. I seem to have escaped the copyright police with my obscure taste in Ragga Jungle / Jump up. Snickering now watch next show will be littered with copyright mutes. To this end, we will be posting the show also on MixCloud. I would have posted this one already but I need to make anew MixCloud graphic. Big Ups to the Junglist family, DMV's D&B Massive, Twitch, Escape Volocity (Sensenet & A1 VooDoo), Tribalistix, Elm Imprint, Rude Operator, SubDistrick, Transit Crew, Indelible B-Side and of coarse SxOne & the Red Sound Lioness.